Total of eight receiver channels in the Great Hall. The on/off button is inside Sennheiser or at the top of the Sabine belt pack. There is a battery level indicator on the LCD screen, if the battery level is low, please call AV Support. The on/off button is on bottom of Sennheiser. There is a battery level indicator on the LCD screen, if the battery level is low, call AV Support. The batteries are not rechargeable. 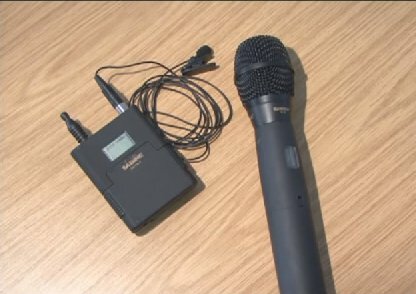 *Please book from AV-Support if out of term-time or teaching hours, or if extra mic required.